The approval has stimulated research into gene therapies for other IRDs. The idea of gene therapy has been discussed in the medical literature since as early as the 1970s. In 1972, Friedman and Roblin proposed that it was theoretically possible to introduce “good” DNA to replace defective DNA.1 Over the years, a number of gene therapy clinical trials emerged in efforts to treat genetic diseases of inborn errors of metabolism, all with varying degrees of success. • The most common type of gene therapy is replacement gene therapy, in which a mutated gene that causes disease is replaced with a healthy copy of that gene. • The positive results of gene therapy clinical trials for RPE65-mediated retinal dystrophy led to the first US regulatory approval of a gene therapy in January 2018. The basic principle of gene therapy is to put corrective genetic material into cells to treat genetic disease. Several gene therapy approaches, including replacement gene therapy, optogenetics, addition of a growth factor, suppression gene therapy, and gene editing, have been proposed in attempts to treat various ophthalmologic conditions. The most common type of gene therapy is replacement gene therapy, which involves replacing a mutated gene that causes disease with a healthy copy of that gene. It is first necessary to identify the causative mutated gene. This technology works best in autosomal recessive biallelic disease with loss-of-function mutations. A vector is then created to carry a wild-type copy of the gene into the cell of interest. The transfected gene is not incorporated into the host DNA but is expressed, resulting in production of a protein with normal function. Scientists and companies have spent decades perfecting the use of vectors for genetic material and identifying ways to deliver them to increase therapeutic efficacy and treatment duration. Early investigations used viruses that delivered genes to every cell in the body, which triggered a massive immune response that could lead to organ failure. More recently designed vectors deliver specific genes to specific cells. With the eye’s unique immunologic privilege, inherited retinal diseases (IRDs) have become one of the leading targets in gene therapy research over the past 15 years. Successful treatment and restoration of vision in vivo was first achieved in canine models with RPE65-related retinal degeneration.6 The successful delivery of a wild-type RPE65 gene using a recombinant adeno-associated virus (AAV), with positive results, paved the way for human clinical trials. RPE65 gene mutations account for up to 10% of autosomal recessive Leber congenital amaurosis and early-onset retinal dystrophy cases.9 Patients with this condition have an early-onset retinal dystrophy phenotype with profound night blindness from birth but residual cone-mediated vision and often mild, if any, nystagmus. The disease usually manifests in childhood. Eligible participants for this trial included patients aged 3 years or older with best corrected visual acuity of 20/60 or worse in each eye or visual field of less than 20°. The primary outcome of the study was multiluminance mobility testing (MLMT). Patients were required to follow a maze at different illumination (lux) levels ranging from a brightly lit office environment to a moonless night. This groundbreaking work and the results of these RPE65 gene therapy trials led to regulatory approval of this therapy by the US Food and Drug Administration in January. Voretigene neparvovec-rzyl (Luxturna; Spark Therapeutics) is approved for the treatment of patients with confirmed biallelic RPE65 mediated IRD. It is the first directly administered gene therapy approved in the United States that targets a genetic disease caused by mutations in a single gene. With the pivotal success and US Food and Drug Administration approval of voretigene for treatment of biallelic RPE65-mediated IRD, ongoing research in other IRDs has exploded. Gene therapy research is being conducted at various stages for choroideremia, X-linked juvenile retinoschisis, Stargardt disease, achromatopsia (CNGB3 and CNGA3), gyrate atrophy, retinitis pigmentosa (RPGR, RLBP1, PDE6A, and PDE6B), Leber hereditary optic neuropathy, and Usher syndrome (MYO7A and USH2A). Advances in the field of gene therapy make the accurate diagnosis of hereditary retinal dystrophies more important than ever. Genetic testing is crucial to identify the underlying cause of disease in this patient population and to allow potential intervention with gene therapy and other novel therapies. The burgeoning field of gene therapy provides hope to patients who previously had no hope of preserving or regaining vision. 1. Friedmann T, Roblin R. Gene therapy for human genetic disease? Science. 1972;175(4025):949-955. 2. Busskamp V, Picaud S, Sahel JA, Roska B. Optogenetic therapy for retinitis pigmentosa. Gene Ther. 2012;19(2):169-175. 3. Hajitou A, Grignet C, Devy L, et al. The antitumoral effect of endostatin and angiostatin is associated with a down-regulation of vascular endothelial growth factor expression in tumor cells. FASEB J. 2002;16(13):1802-1804. 4. Cong L, Ran FA, Cox D, et al. Multiplex genome engineering using CRISPR/Cas systems. Science. 2013;339(6121):819-823. 5. Cong L, Ran FA, Cox D, Lin S, Barretto R, Habib N, Hsu PD, Wu X, Jiang W, Marraffini L, Zhang F. Multiplex genome engineering using CRISPR/Cas systems. Science. 2013;3:1231143. 6. Acland GM, Aguirre GD, Ray J, et al. Gene therapy restores vision in a canine model of childhood blindness. Nat Genet. 2001;28(1):92-95. 7. Cai X, Conley SM, Naash MI. 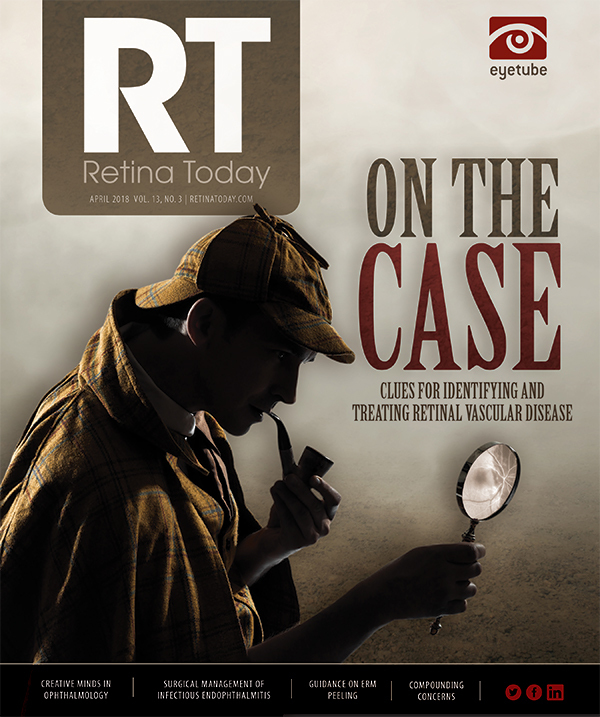 RPE65: role in the visual cycle, human retinal disease, and gene therapy. Ophthalmic Genet. 2009;30(2):57-62. 8. Russell S, Bennett J, Wellman JA,. Efficacy and safety of voretigene neparvovec (AAV2-hRPE65v2) in patients with RPE65-mediated inherited retinal dystrophy: a randomised, controlled, open-label, phase 3 trial. Lancet. 2017;390(10097):849-860. 9. Kumaran N, Moore AT, Weleber RG, Michaelides M. Leber congenital amaurosis/early-onset severe retinal dystrophy: clinical features, molecular genetics and therapeutic interventions. Br J Ophthalmol. 2017;101(9):1147-1154. 10. Luxturna [package insert]. Spark Therapeutics. 2017. 11. A US drugmaker offers to cure rare blindness for $850,000. CNBC website. January 3, 2018. www.cnbc.com/2018/01/03/spark-therapeutics-luxturna-gene-therapy-will-cost-about-850000.html. Accessed March 16, 2018.